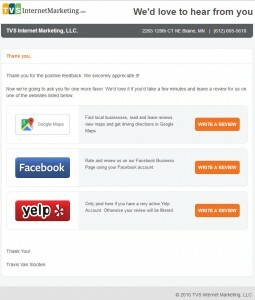 Frequently Asked Questions - TVS Internet Marketing, LLC. What types of small businesses do you work with? I work with all types of small businesses – from chiropractors and dentists to fence contractors and gutter installers (and everything in between). Basically if you provide a local service or product, you’re the type of business I work with. Browse my testimonials to see the various types of businesses I work with. What Internet Marketing services do you provide? My core services are local PPC (pay-per-click), local SEO (search engine optimization), reputation management, and website design & development. In addition to this I provide web maintenance services and general consulting. How long have you been doing this - are you any good? I’ve been a full-time internet marketer since 2005. In the early days my expertise was SEO and affiliate marketing. Over the years I broadened my skills and experience to include website buying and selling, content marketing and blogging, pay-per-click, and local SEO. I’ve been working with small business owners exclusively since 2011. With my broad skill set, I have been able to help my clients achieve amazing results as shown on my testimonials page. If you want to learn more about my professional career, please visit my professional profile page on TravisVanSlooten.com. Internet marketing companies and consultants are a dime a dozen. Why should I hire you? It’s true. There are plenty of companies and consultants to choose from. I think what separates me from the rest is my broad internet marketing experience and the high level of customer service I give each and every client I work with. When you hire me, you’re working with me and me alone. You wouldn’t be dealing with a big company that may have you talking to three different “specialists.” You won’t be constrained to talking to me only during certain hours. I’m available via email, cell, or text around the clock. And unlike most companies, you will actually hear from me on a regular basis as I’ll provide you updates on everything I’m doing to get your business found online and to get your phone ringing with customers! What if I'm unhappy with your services? Do you offer any guarantees? Warren Buffet is quoted as saying, “It takes 20 years to build a reputation and 5 minutes to ruin it. If you think about that, you’ll do things differently.” I live by that credo. My reputation is more important to me than making a buck. At the end of the day, all a small business owner has is his reputation. As a small business owner yourself, you know what I mean. If you’re not happy with me or the services I’m providing, I’ll do whatever it takes to make things right – including refunding your money if necessary. I’m proud to say in the time I’ve been doing this, I’ve never had a client demand a refund. If you’ve been burned before in the past and are nervous about hiring me, please call me. I’m confident I can put your mind at ease and assure you that you will be in good hands. PPC, or pay-per-click, is a form of paid advertising. You are paying for your ad to be displayed on Google or Bing. You are charged every time a person clicks on your ad, or “per click.” For example, let’s say you pay $5 per click and your ad gets clicked on five times, you’ll pay $25. What are the advantages and disadvantages of PPC? The advantage to PPC is you can get your business instant visibility online. Within hours of starting a PPC campaign, you can have visitors to your website! Another advantage of PPC is that the information you get from a PPC campaign can be very useful for SEO. For example, you can see exactly what keywords people search for in your area and then you can target those keywords in your SEO campaign. Another argument for PPC is that unlike SEO, you have 100% control of our campaign. As long as you’re willing to pay, you can be ranked #1 for any keyword for as long as you want. The disadvantage of PPC is that it only works for as long as you’re doing it. Unlike SEO where once you get your rankings you can “coast” for a while, you don’t have that luxury with PPC. You have to continuously pay to keep your ad displayed. As soon as you stop, your ad disappears and so does all the traffic to your website. The other disadvantage to PPC is that the click through rates for ads aren’t as good as the click through rates for organic results because people tend to ignore paid ads. Finally, PPC can be very expensive in some competitive niches and markets. If I’m doing SEO, do I need to do PPC? SEO and PPC is not an either/or decision. They can actually work great together. Because SEO can take time, you can do PPC to kick start your online presence. And as I mentioned in a previous answer, you can use the PPC data to determine what keywords to target for your SEO campaign. It’s also impossible to rank for every keyword doing SEO so you can supplement your SEO efforts with PPC by targeting those keywords that you’re not ranking for organically. If I’m already doing PPC, how can you help me? Unless you are trained how to do PPC properly, or have had a professional set up a campaign for you, I can guarantee you that you are wasting money. In every case where a small business owners comes to me that is already doing their own PPC, they are wasting money. If you’re doing your own PPC I will immediately be able to help you reduce your costs. I will also be able to help you get more clicks and a better return on your investment! Usually not. The only time there is a set up fee is if your campaign requires more work than a typical small business PPC campaign. In most cases a set up fee isn’t required but if I need to charge one it varies between $150 – $250. I will let you know before I begin working on your PPC if there is going to be a set up fee and what it will be so there are no surprises! No. My ongoing PPC services are month-to-month. You can cancel any time. What will be my total monthly costs? The monthly management fee is $299. That covers my time to monitor and optimize your campaign on a weekly basis. I provide weekly updates for you as well. In addition to the monthly management fee is the money you spend on ads. This is called your monthly ad budget. You decide how much you want to spend but I recommend you spend a minimum of $500/month. If you spend less than that you won’t get enough clicks (and leads) to justify the management fee. Most of my clients are spending between $1,000 – $2,000/month on ads. Let’s say you’re going to spend $1,000 on ads. Your monthly fees would be $1,299 ($1,000 for ads and $299 for the monthly management fee). Do you require a minimum monthly ad budget? I’ll work with you no matter what your budget is but as I mentioned before, I recommend you spend at least $500/month on ads if you’re going to pay someone else to manage your PPC for you. You can spend as little or as much as you want, however. You’ll be charged the same monthly management fee ($299) no matter what you spend as long as your monthly ad budget doesn’t exceed $3,000. What is the monthly management fee if I spend more than $3,000 on ads? If you want to spend more than $3,000 on ads, my monthly management fee is $599. This fee covers monthly ad budgets up to $10,000. What search engines do you offer your PPC services? In most cases I focus strictly on Google. The majority traffic to small business websites comes from Google due to Google’s dominance in the search market. In fact most small businesses get 80-90% of their search traffic from Google. It only makes sense to focus our efforts there. I will only expand your PPC efforts to Bing after we already have a well-optimized and profitable campaign on Google (and you choose to increase your budget to expand to Bing). The majority of my clients, however, choose to focus strictly on Google. Will you manage my campaign through your AdWords account or mine? I never set up and manage my clients’ campaigns under my AdWords account! If you don’t already have an AdWords account, I will help you set one up. Your campaigns will always be set up and managed in your account. Do I pay you directly for my monthly ad spend? No. When I set up your campaign in your AdWords account, you’ll be required to supply your credit card information to Google. You’ll be charged automatically by Google for your ad spend. You’ll only pay me directly for the monthly management fee. I will send you an invoice every month for my fee. What will I get with the free ppc evaluation and is there any catch? Once I complete your free ppc evaluation you’ll get 20 minutes of video from me delivered in 4 five-minute videos. There won’t be anything for you to download either. I’ll send you links to your videos and all you’ll have to do is click on them to watch. There is no obligation or strings attached to these free evaluations. These evaluations simply give me an opportunity to learn more about your business and demonstrate my expertise. If you choose to hire someone to help you with your PPC, I hope you choose me but if you don’t, no biggie. Either way you’ll get some great insights on your PPC! If you’re not doing ppc my free evaluation can still benefit you as I’ll create a personal video for you where I’ll walk you through the keywords and markets you may want to target if you decide to do ppc. I’ll also show you how much you can expect to pay per click given those keywords and markets. SEO stands for Search Engine Optimization. When we talk about SEO there is “on-page SEO” and “off-page SEO.” On-page SEO consists of all those things we do to optimize your website. Off-page SEO consists of all those activities we do outside of your website such as getting backlinks to your website. Search engine optimization then is the process of doing both to get your website to rank high in the search engines such as Google, Bing, and Yahoo! Local SEO is still SEO as defined above but our focus, in terms of rankings, is on geo-related keywords or keywords that typically have “local intent.” For example, an ecommerce store may sell pool supplies that they ship anywhere in the country. They might want to rank nationally for the very broad keyword, “pool filters.” This would be an example of “regular SEO” for a lack of a better term. If you are a local pool contractor in Tampa Florida on the other hand, you don’t want to rank nationally. You want to rank locally. When people living in and around Tampa search for keywords such as “pool contractor tampa” or just “pool contractor,” you want to rank high in the search engines! This is what local SEO is all about and what I specialize in when I do SEO for small businesses. I make sure your website is found locally in Google! What are the advantages and disadvantages of SEO? The main advantage of SEO is that over time, you will get the most return on your investment – more so than even PPC. Assuming you’ve obtained your rankings ethically (i.e. you didn’t get them by doing black hat techniques), your rankings will likely hold for a long time. Your rankings will continue to generate new business with little effort and money. Unlike PPC, you won’t have to keep spending money on clicks. Organic search results also have a higher click through rate than PPC ads. This is because people tend to ignore the paid ads and instead focus on just the organic search results. The disadvantages of SEO are you have very little control over your rankings and SEO takes time to achieve your rankings – typically 6-9 months (and sometimes longer). Google is constantly making changes to their algorithm so what’s working today may not work tomorrow. It can be very unpredictable. How long will it take to improve the rankings of my website? It depends. The size of your local market and the competitiveness of your industry will ultimately determine how long it will take to improve your rankings. Your backlink profile will also play a factor in how long it will take. Your backlink profile is the quantity and quality of links pointing to your website. The better your backlink profile is the faster it will take to rank. As a general rule of thumb you should not expect results for 6-9 months (and sometimes longer). That’s the unfortunate nature of SEO. It takes time and patience! Will you be able to work with my existing website or will you require I build a new website? When you talk to SEO companies, it’s not uncommon for them to say your site has to be totally redone. The truth is, in many cases this advice is true. A lot of times small business owners will have websites that are too basic or restrictive in what we can do to make it rank better in the search engines. This is usually the case when business owners are using simple (and usually free) website templates or website builders. However, this isn’t always the case! If I believe your website has “solid bones” and has a platform robust enough to work with, I’m not going to tell you we have to rebuild your site. I’ll gladly work with your existing site. Truth be told, being able to work with an existing site makes my job easier and typically will get us results faster so I like it when I don’t have to redo a site. Unfortunately, a lot of companies will recommend you need a new website no matter what because they want the additional business or they’re more comfortable working with a platform they are comfortable with. That is not how I operate. If you have a solid website I can work with, I’ll work with it. If you don’t, I’ll be honest about that too but I always strive to demonstrate why you need a new website so you understand my recommendation. No. My local SEO package is a one-time optimization package. With that package I build a solid SEO foundation to build on. In many cases, that package is enough to see noticeable results. If you’re in a very competitive market, however, you may need ongoing SEO. In those cases you will need to create high quality content, get high quality backlinks, and build your online reviews. I can help with ongoing SEO if it is needed and there is never a contract required. It’s always month-to-month. Will Reputation Manager work with any type of business? Reputation Manager is designed for any small business that wants to stand out from their competition by having a positive reputation online. If your business has a website and it’s important to you to have positive testimonials on your website and positive reviews online, then Reputation Manager will work for you! How exactly does Reputation Manager manage my reputation? When we talk about reputation management we’re talking about what others say about you and your business online. These opinions can be voiced on review sites, social media sites, forums, blog, and just about any other web page online. Online reviews, however, have the greatest impact on a local business owner’s reputation and their bottom line. 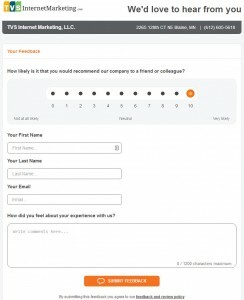 Reputation Manager addresses just that – your online reviews.It’s a tool that will help you get more reviews online while helping to prevent negative reviews from appearing online. If you actually use the tool, over time you’ll have a lot of positive online reviews on review sites that have the greatest impact on your business. The result will be your business will stand out more in the search results and you’ll generate more business because of it! Are the reviews I get from Reputation Manager real or are they fake? If they give you a rating of 7 or higher, they are redirected to a page where they are encouraged to leave you an online review. The other method the tool helps generate reviews is by emailing your customers. You enter your customers’ first and last names, and their primary email addresses into the tool. Reputation Manager then sends an email to them asking them for feedback and an online review. If the customer doesn’t respond to that first email, Reputation Manager sends a follow up email a few days later. Most people will respond after two emails but if they don’t, then the tool doesn’t follow up again because we don’t want to upset your customers by pestering them! How does Reputation Manager help prevent negative reviews online? Reputation Manager uses a filter that helps prevent negative reviews from being left online. 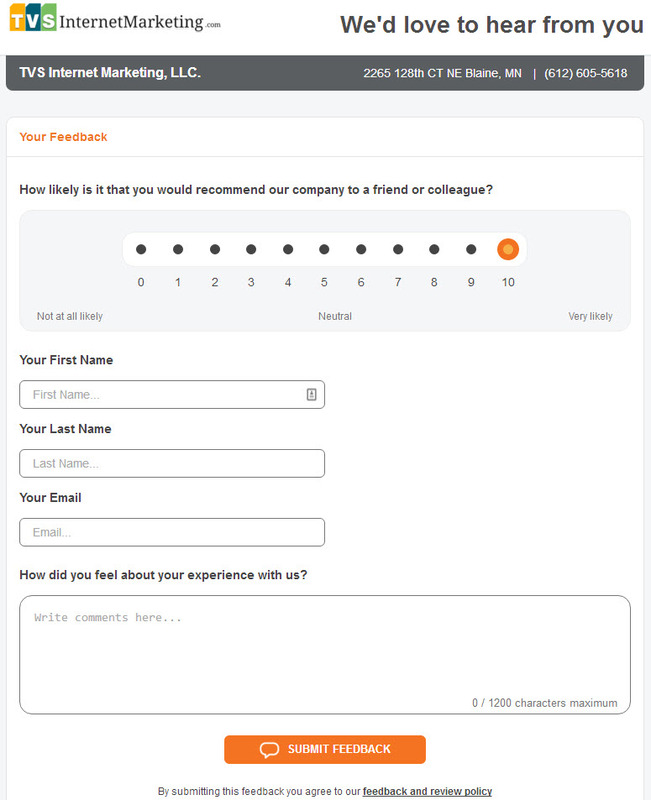 When your customers go to the feedback page they are asked to rate your business on a scale from 1-10. If the customer gives you a rating less than 7, then they aren’t redirected to the page where they are encouraged to leave an online review. Instead, their rating and feedback is sent directly to you via email. This gives you a chance to follow up with customer and address their concerns before they go off and start leaving you bad reviews all over the internet! Please Note: While Reputation Manager does a great job preventing negative online reviews, there is no guarantee that it will prevent all negative reviews from occurring. If a disgruntled customer is determined to leave you a bad review online they will. The good news is if you have Reputation Manager in place and you’re diligent in following up immediately on any negative feedback you get from the tool, you’ll have a far greater chance of preventing a negative review from happening! How difficult is it to get started with Reputation Manager? Is there anything to install? Reputation Manager is really easy to use and because it’s a web-based tool there is absolutely nothing for you to install! As soon as you submit payment you can be up and running immediately. The set up fees covers my time to configure the tool specifically for your business and to walk you through the tool. It’s totally painless to get started and requires very little of your time. Does Reputation Manager require a lot of time to manage? Reputation Manager is a fully automated tool and for most businesses requires less than 20 minutes per week if the email functionality is used. The email function allows you to upload customers names and email addresses so the tool can follow up with them with an email requesting feedback and a review.Otherwise if you don’t use the email function and you just have a link to the Reputation Manager feedback page on your website and/or give that link to your customers, there is no ongoing management required! As customers visit your feedback page you’ll start getting more testimonials and online reviews. Does Reputation Manager work on any PC, Mac, Tablet, and Smartphone? Yes! Reputation Manager is a web-based tool so you can access it on any device that has an Internet connection and a browser. And because Reputation Manager is 100% mobile friendly it’s easy to read and use on any mobile device. Can you explain the fees? Sure. You pay the one-time set up fee of $99 and then $19/month starting in month 2. You don’t pay the $19 for the first month as the first month’s fee is included in the set up fee. What does the $99 set up fee cover? You’re a business owner so you have better things to do than learn how to use a tool! Even though the tool is very easy to use it would still take a good hour or two to get familiar with it and get it all configured if you were to do it on your own. When are you going to find time to spend even a couple hours doing this? Probably never, right?The set up fee covers my time to configure the tool specifically for your business and to show you how to use the tool. You also have a direct line to me to ask any questions you have as you use the tool. You’ll have access to a number of tutorials on how to use the tool but you won’t need them because I’ll be setting everything up for you and I’ll be available to answer any questions you have! Can the set up fee be waived? Yes. If you’d rather spend the time going through the tutorials on how to configure and use the tool than have me take care of everything, that’s perfectly fine. Just let me know when we get started that you’d rather set everything up yourself and I’ll be sure to waive the set up fee. I rarely get this request but if you’re a do-it-yourselfer and would rather go through a few tutorials to get up and running, that’s great. I’ll gladly waive the fee. Do you require long-term contracts to use Reputation Manager? No. You can use Reputation Manager for as long as you want. It’s month-to-month. Whenever you want to cancel just let me know. What happens to my testimonials and reviews if I cancel? When you are done using Reputation Manager, I don’t hold your data hostage. You can export all your customer data and testimonials at any time. Because reviews are left on 3rd party review sites, those will remain in place as well. I don't have a website. Of the three website packages you offer, which one do you recommend? If you don’t have a website or the one you have isn’t that great and you don’t have a large online marketing budget right now, the Starter Website package is the best choice. If you can spend a little more and you want a total custom designed website, then the Custom Website package is what you want. The Premium Custom package is usually best for small businesses that have an established website already, have an active social account or two, and have a lot of content. What's the difference between a template website and a custom website? A template-based website is a website that is pre-designed but can be modified in hundreds of different ways to suit your needs and likes. With the design flexibility of a template, you can have a totally unique, highly professional-looking website without spending the extra money on a full-blown custom design. The only drawback to working with a template is that there are some restrictions. It’s not a custom design so you are limited to a degree by what the template provides. If you have a very specific design in mind that can’t be accomplished with a template then you’ll want a custom designed website. A custom designed website is a website that is totally unique and custom designed for you. You aren’t restricted to a template so the design possibilities are endless. You tell me what you want and I have it designed and built for you! What platform do you use to build your websites? I use WordPress exclusively. WordPress is one of the most widely used platforms used today. In the early days, WordPress was primarily known for blogging but today you’ll find ecommerce sites, membership sites, Fortune 500 websites, and small business websites all using WordPress! Do I really need a website if I'm already using Facebook to promote my business? Yes, and here’s why: your website is the foundation of everything you do online. It’s also the only asset online that you own and control 100%. You don’t own your Facebook page – Facebook does. Facebook can make changes any time they want and those changes can have a dramatic impact on your business – and not in a good way either! Your website is the foundation of your online marketing and everything else you do supports that foundation. Facebook, Instagram, Twitter, etc. are all assets you use to promote your business but you never want to rely on any one of them as your primary online asset. That’s a recipe for disaster in the long-term. Furthermore, if you rely solely on assets like Facebook to build your online business you’ll never get the organic traffic like you will with a website you own. And you can’t do PPC effectively either without having a website. Bottom line, you absolutely need your own website to be successful online over the long-term! I really like my current website. It just needs minor tweaking and updating. Can you still help me? Absolutely. If you just need some minor design and/or functional tweaks to your current site I can definitely help. While the bulk of my website design and development work consists of complete overhauls and rebuilds, I do minor design and development work as well.